My brother and my cousin found four or five (they weren’t sure) kittens on our road. 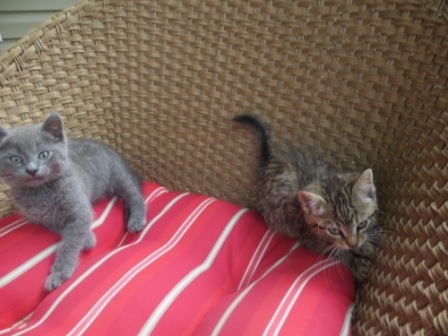 Sometimes people leave kittens on roads when they don’t want them. 😦 We tried to get all the kittens but they were scared and ran off. We looked for hours and hours but we only caught 2. Once we held them, they were happy and nice. They were hungry so we fed them fish we had. 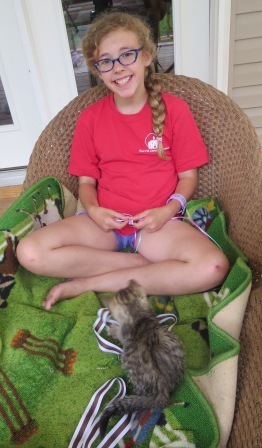 My friend Vanessa helped me take care of the kittens. We made them a home in my dog Clydes crate but let them out a lot. 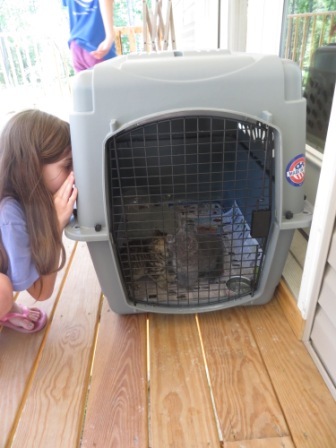 We all went out the next day and tried to find the other kittens, but we couldn’t. 😦 I hope they are okay. I played with the kittens. 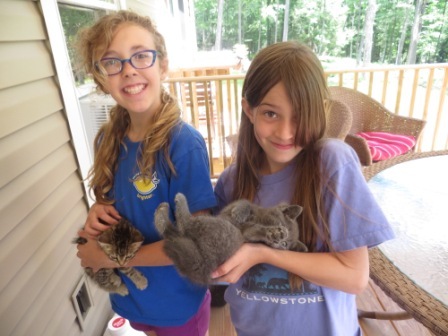 We had then for a week and took care of them. My mom posted the kitten’s pictures on Facebook and someone wanted to adopt them. It was my aunt who lives three hours away. 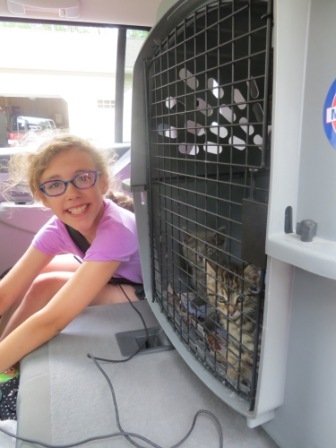 My grandparents said they’d drive the kittens to their new home and I got to go with them! I am glad we saved two kittens. I am sad we didn’t get the others. I am really sad someone would leave them on a road with nobody to help them! Last year our house was getting built. There was a puddle with a million tadpoles in it near the garage. The water was black there were so many tadpoles. Then it got hot and the puddle dried up. I was sad when I saw it. All the tadpoles died. But Frank the guy who built our house told me he scooped up a bunch of the tadpoles when he saw the water going and he put them in the spring. He saved some! Now we live in the house. The puddle came back. This year I didn’t want any of the tadpoles to die. 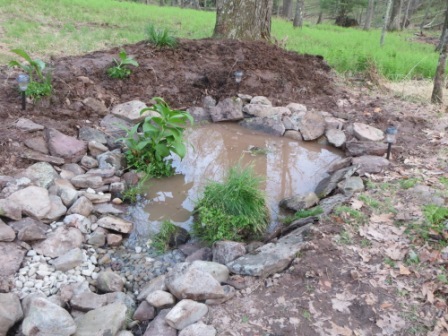 My mom and dad (and Erik) helped me make a frog pond. I read about frog ponds at Save The Frogs click here and I read some books about frogs too. 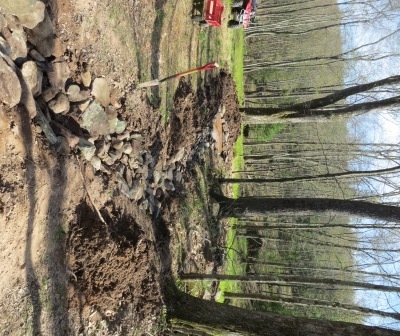 First we dug out the area where the pond was going to go. 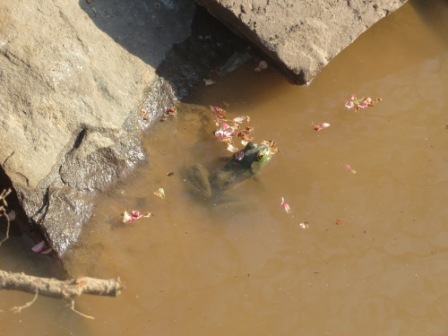 Frogs like water that doesn’t move but they still need fresh water sometimes. 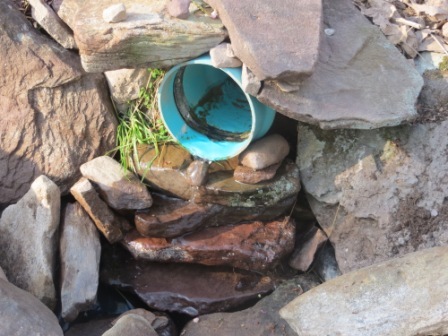 Water for the pond comes from a drain (my dad said it is a foundation drain). The pond can’t be too deep. The water from the drain made a puddle away from it. 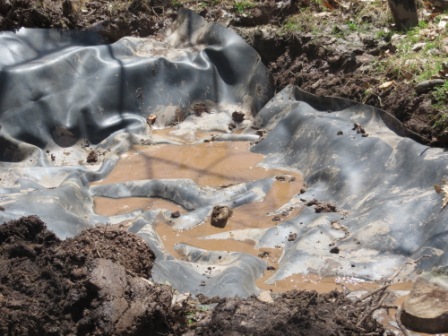 We dug it out and put rubber in the bottom to keep the water. 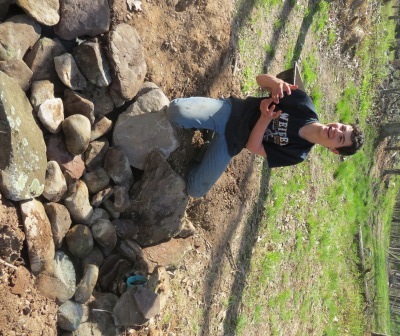 Then we put rocks in it. Clyde helped. Erik covered the pipe up to make it look nice. He made it so there is a little waterfall. 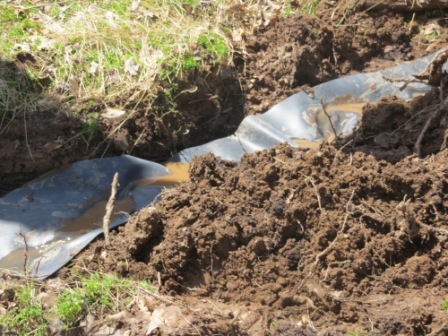 If the water stops coming from the pipe in the summer we can bring water to the pond from our hose so it doesn’t get dried up. 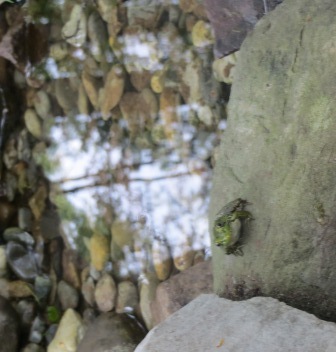 There was a frog that jumped into the pond right away! 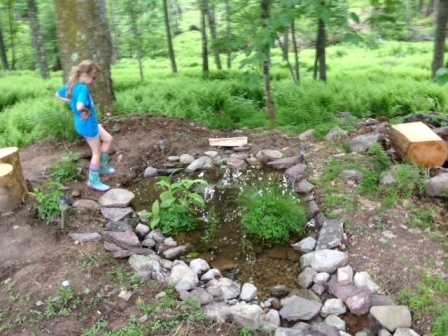 We put mud and rocks back into the pond. 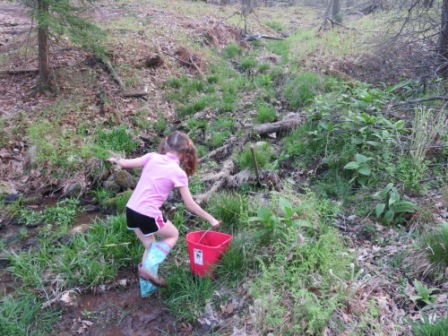 We went to a stream near our house and got plants. 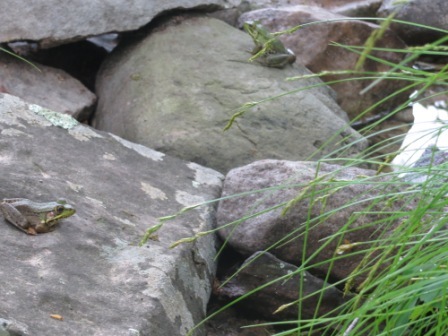 Frogs like to hide in plants and the mud and rocks. 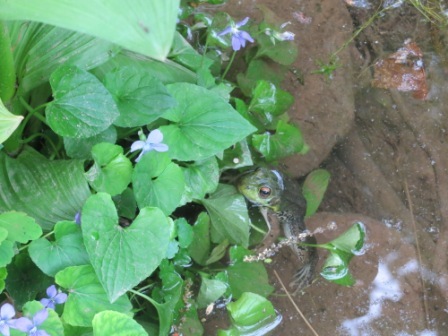 We put the same kind of plants in the pond that are found around our house. I got solar lights to put around the pond. I think bugs will like the lights and frogs will like the bugs! The frog seemed happy. More frogs came. I counted seven. Then I had eggs in the pond a few days later! 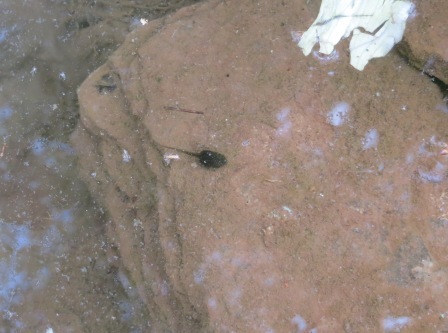 Now we have tadpoles! I feed the tadpoles smashed up spinach. My mom, dad and Erik surprised me with making benches out of logs to put around the pond (I was at a friend’s house). Now we can sit and watch the frogs. I’m glad we made the pond! I am going to send a picture of it to Save The Frogs! Please visit the website (here). They try to help frogs and frogs are in trouble! 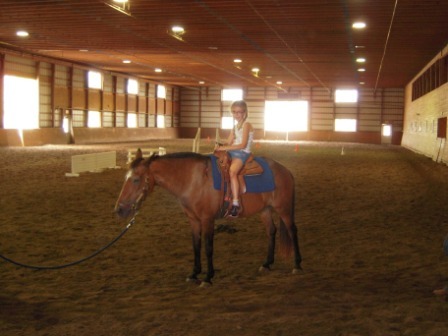 I Got to Ride on a Pony! I got to ride on a pony for my friends birthday. I had to wait my turn. 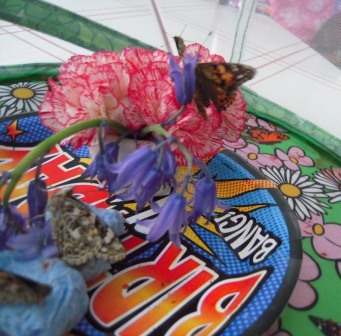 I Grew Butterflies from Caterpillars! 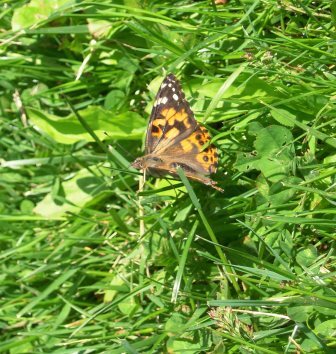 I got a butterfly growing kit for my birthday. 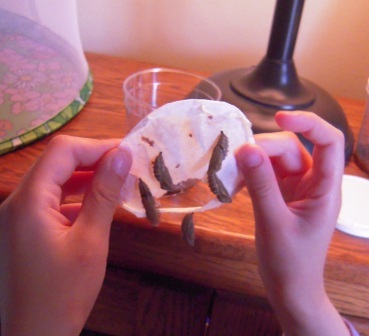 We got caterpillars in the mail. They were black and little. Do you think they are little? I wrote in my notebook every day. I measured them and drew pictures of them. Then the caterpillars grew big. Then they hung from the top of their cage. I took them out. They were stuck to the paper. 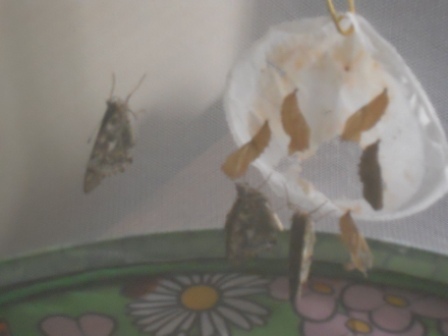 They were all in chrysalis’. Then I pinned them to their new cage. 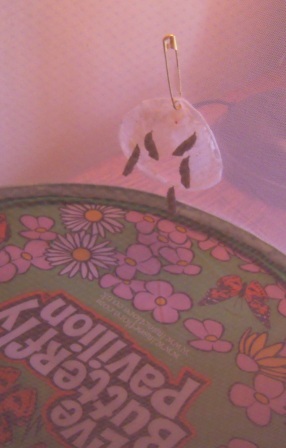 I put flowers inside the cage with sugar-water on them for the butterflies to eat (don’t drink it). Then I let them go. 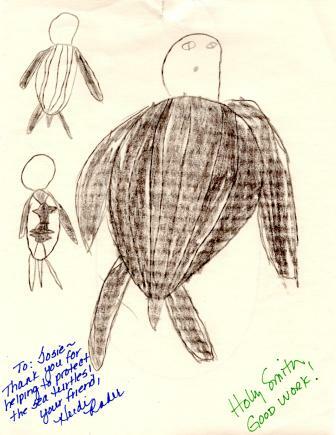 I went to the bookstore to learn about turtles. 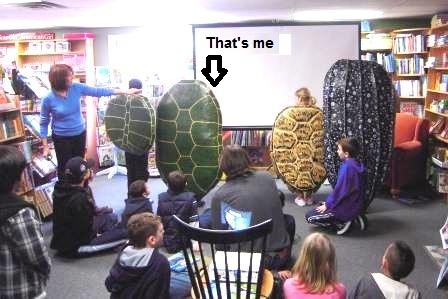 I got to pretend to be a turtle (you can’t see me behind the green shell)! 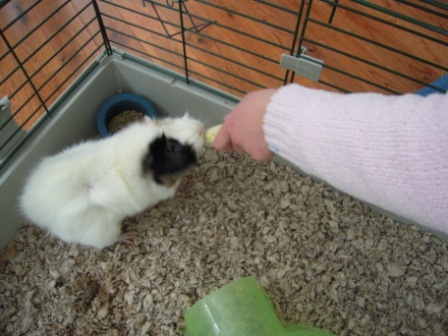 I got to be a pet sitter! My friends went skiing and I got to pet-sit their pets. 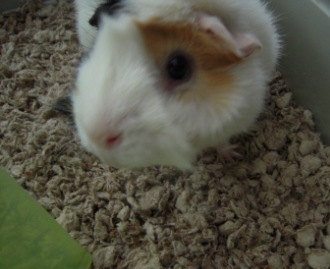 I got to pet sit Basil the Guinea Pig. He made a lot of noise. He always pushed his food bowl over but he was very cute. We put his cage near Smokey‘s so he would have a friend. I also got to pet-sit two hermit crabs. They took a lot of work. 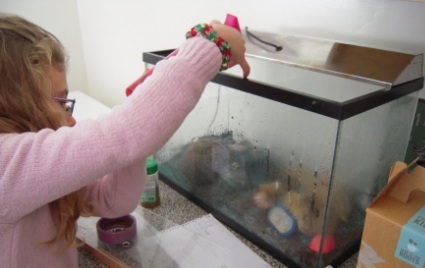 I had to spray their tank to keep water in it. There was a dial to show if it needed more water. 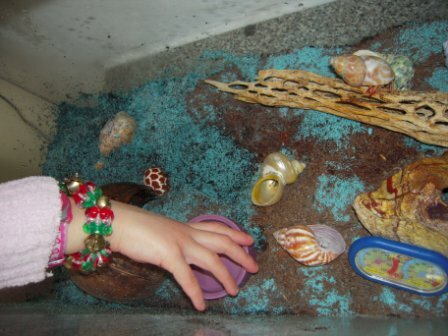 The hermit crabs liked to sit in their food bowl. 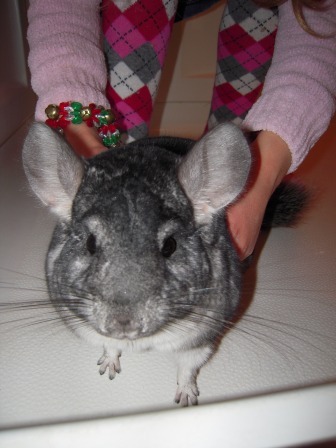 I have a pet chinchilla named Smokey. He lets me hold him and he likes to jump on me. I feed him timothy hay and raisins for treats. 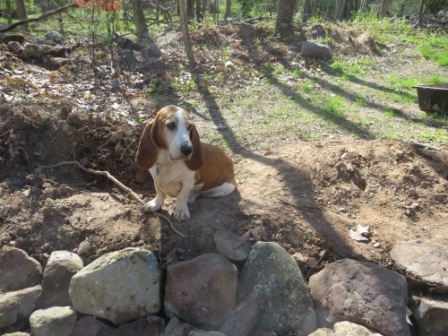 Isn’t Smokey cute? 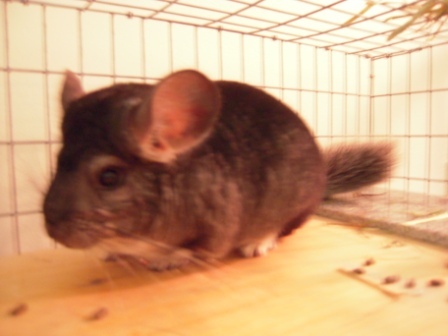 Chinchillas are from South America. They live in the mountains. Smokey is nice and he likes people and he likes you to hold him.